NEW YORK (Reuters) -- Treating elderly patients for depression can help ease arthritis pain, an unexpected and hopeful finding for sufferers of the degenerative joint disease, the author of a study released on Tuesday said. Depression affects roughly one in six older Americans, while four out of five suffer degenerative joint disease after age 70, according to the study in the newest issue of The Journal of the American Medical Association. Older people treated for depression with medication and therapy not only showed fewer symptoms of that depression after a year, but their arthritis symptoms eased as well, the study showed. They had less pain and less interference with daily activities due to arthritis, it showed. "This was a very interesting, somewhat unexpected benefit of depression treatment. This was not something that we knew we would find," said Dr. Elizabeth Lin, the study's lead author. Given there is no known cure for arthritis, "it was nice, encouraging news," she said. "We were just so delighted to see improvement in the arthritis area." 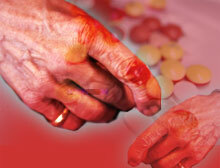 The study is the first to look at the effect of depression treatment on arthritis, she said. It included 1,801 depressed adults over age 60 in five states from July 1999 to August 2001.